A site visit and testing are critical to the process. 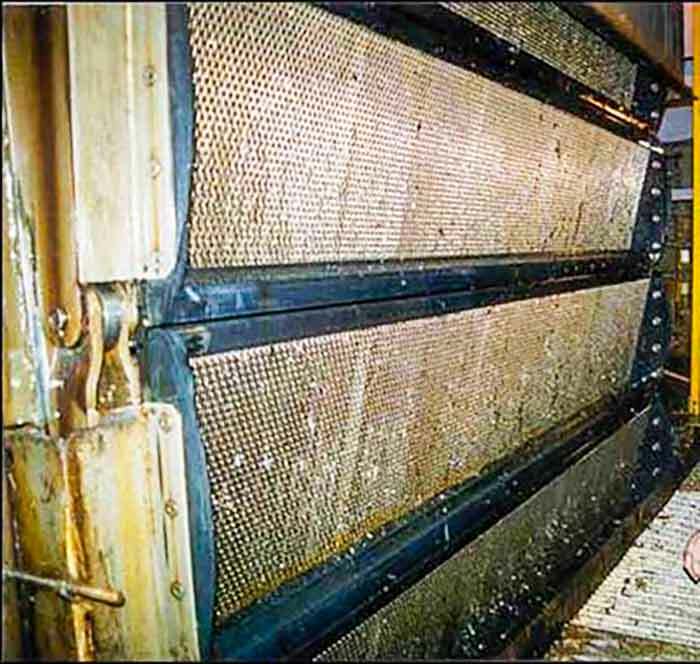 The Environmental Protection Agency’s (EPA) 316b requires utilities to reduce condenser cooling water velocity at intake screens to mitigate the impact on aquatic life. For utilities, this affects primarily “once-through” circulating water systems, or units without cooling towers. For existing plants, there is considerable flexibility on a local basis to support practical and cost-effective solutions to strike a balance between environmental and plant economic issues. Incorporate variable speed drives (VSDs). Increase inlet screen area (see Image 2). Options should be evaluated for best fit based on 316b compliance, first cost, ongoing costs, time to implement and impact on unit capacity and heat rate. As a cost-effective option, some plants have considered throttling their circulating pumps as a means to lower screen velocity. But simply reducing flow rate by throttling, if achievable, results in other trade-offs. While throttling is cost effective to try (and is reversible), it must be evaluated for impact on unit heat rate and output. Using the pump discharge valves or condenser inlet or outlet valves to throttle also requires review of the valve design for throttling mode. These valves are usually butterfly isolation type and not designed for continuous throttling. Additionally, the circulating water pumps may not be candidates for long term operation at the lower flow rates due to their particular hydraulic design. Partial throttling (i.e. more modest flow reduction, staying above the recommended minimum flow rate) may be more practical if combined with other options, such as cascading pumps (idling one in the winter) or traveling screen inlet area increase. Several sites with older, idle units have been studied. 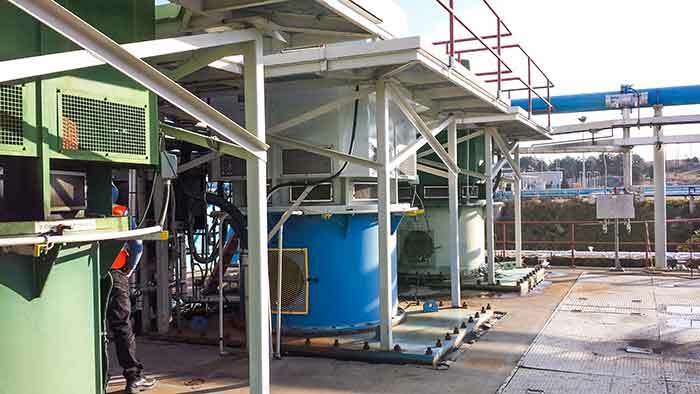 These idle units could allow refurbishment and utilization of their existing intake structures to increase screen area and lower intake velocities without the major expense of new screens or intake structures. There are other factors that affect the acceptable minimum flow, such as impeller inlet velocity (tip speed), energy level, inlet design and materials of construction that also need to be considered. In general, lower energy pumps will operate acceptably at lower flow rates than higher energy pumps. One measure of energy level is the impeller tip speed, which is the velocity of the impeller inlet tip, typically expressed in feet per second. The inlet tip speed is calculated as shown in Equation 1. Typical inlet tip speed design values for circulating water pumps range from 50 to 85 feet per second (ft/sec), with the higher tip speeds requiring higher minimum flow rates to avoid damage. Any consideration of throttling for long periods needs to evaluate the inlet tip speed as well as other key factors. From involvement in various 316b system studies, some generalizations can be made. Many older systems lack “design basis” documents, such as pump curves, system resistance curves and hydraulic gradients. These are important for analysis and future plant needs and can be recreated as part of the testing program if missing. 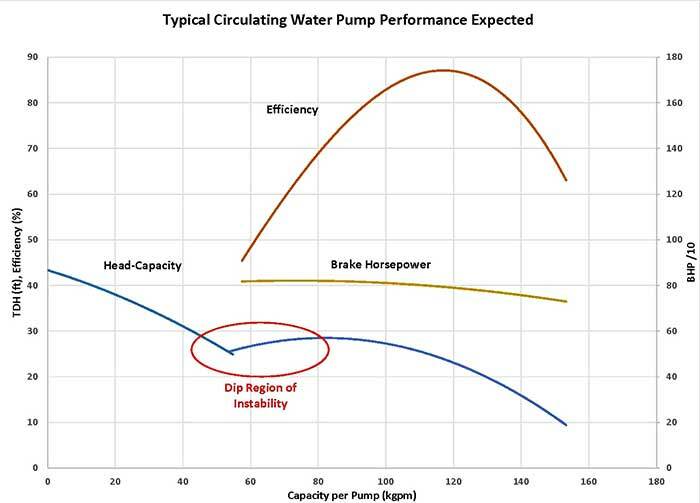 Most pumps were not designed for low flow operation (some performance curves do not even provide low capacity data, since it is not recommended to run the pumps there). Many pump curves are not completely accurate due to worn pump components, inaccurate original curve (often the dip area is misrepresented), or use of incorrect replacement hydraulic components. Circulating pumps used in parallel (most cases) must maintain the same rpm. If the system uses VSDs, they must be used on all pumps in a common unit and operate at nominally the same speed. Condensers are often running inefficiently and lack instrumentation to monitor and trend performance including cleanliness (increased pressure drop due to tube fouling), liquid level in water boxes and presence of vacuum leaks.